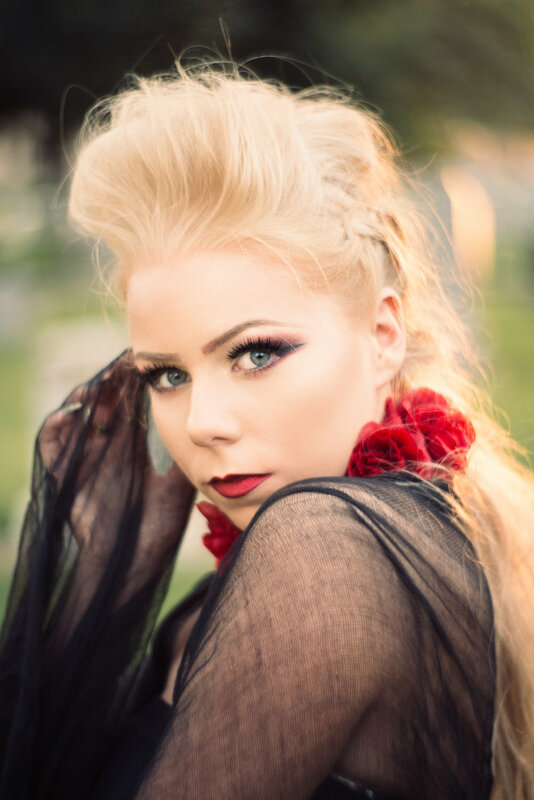 This photoshoot took place in a historic cemetery with many of the tombstones from the 1800s and early 1900s. The ghostly cemetery cats watching us gave the feeling of a scouring presence. I combined powers with the super talented and inspiring model Kristen Pro, who is also a sponsored yogi. Her yoga background provided some unique poses along with a full wardrobe that she pulled together herself, and spot-on makeup artistry— she is super talented!! She embodied the gothic, creepy cemetery vibes and the whole shoot felt like a flowing art piece. The hair stylist, Carissa Pierotti, and I met at an art show in San Jose where she was showcasing her work and I have been excited to work with her ever since. The cemetery spirits even seemed to have added in a little touch to the photos. We had so much fun doing this shoot and I love the mystical, authentic, and creepy essence produced from our dream team collaboration!